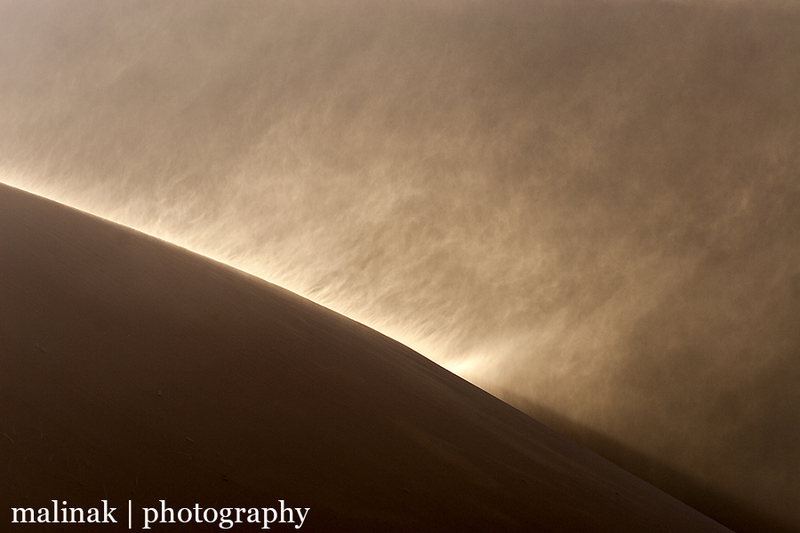 Sand makes a special whistling sound when it is being blown off the edge of a 150 meter tall dune. It is the sound of an inexorable force altering an inconceivably immense structure; one minuscule grain of sand at a time. It also pelts the heck out of any exposed skin. I think it was this part of the trip that we were most looking forward to – finally seeing Deadvlei and the towering sand dunes surrounding Sossusvlei. Tucked in the middle of the Namib-Naukluft National Park of Namibia, Sossusvlei is a famous pan surrounded by enormous reddish, orange sand dunes. Vlei is an Afrikaans word for a small shallow lake, and in the deserts of Namibia, that more often than not means a dried lake bed – or pan. Sossusvlei itself is occasionally filled with water following exceptionally heavy rains that allow the Tsauchab River to flow all the way into this dead end pan. Though the area is referred to as Sossusvlei, it is actually Deadvlei that is the most famous pan, at least from a photography perspective. Most people have seen pictures of dead trees in the flat shimmering white earth with the orange dunes around. However, sitting atop the impeccably named Big Daddy sand dune and looking down on Deadvlei as the sun rose behind us, was the culmination of a decade of longing. We couldn’t contain our excitement any longer and charged down the enormous dune, twenty minutes up and no more than two down! Unlike Sossusvlei, Deadvlei never receives water, unless it actually rains on the pan. The ground was deeply parched and crumbled with every step we took. The trees, long since petrified, stood like quiet sentries watching over the lifeless scene. It was exactly what we had hoped it would be! Rarely do you look forward to something for so long and then it lives up to your hopes and dreams. For us, Deadvlei did. We could have spent all day there, but considering it was meant to be 40+ degrees, and there is no shade, we decided that lunch in the shade near Sossusvlei would be in order. Sand dunes are amazing because the outer layers are constantly in flux and yet the very middle of the bottom layer might not move for thousands of years. Certainly sitting atop Big Mamma, the dune that overshadows Sossusvlei, it was easy to dwell on the dichotomy of these fascinating geographical features. From up here the sand was constantly being blown off the top and yet looking around at the sea of sand dunes, it seemed implausible that these mountains of sand ever disappeared from their current locations. There are sand dunes throughout the entire 60 kilometre drive along the dry Tsauchab River. Some, like Dune 45, are famous, most others are not. The scenery along the way is spectacular, with dunes rising up on both sides and the sun casting strong shadows making them appear almost black in places. Anyone can drive the tarred road from the entrance gates to the car park, where tractors will take you the last five kilometres to Sossusvlei and Deadvlei. Or, you can try your own luck if you have a 4×4. Being adventurous souls, and recalling our sandy exploits on the other side of the continent in Mozambique, we of course went for it. Not a problem. However, the second trip later the same day we were really struggling to make headway and after perhaps 2 kms, we got bogged down. So, we got out, and started letting a bit more air out of the tyres and I got back in the car. At that point I realised the reason why we were stuck – I had forgotten to switch on the 4×4 when we left the tarred road! So, 4×4 engaged and Bob’s your uncle, we were out and on our way again. Moral of the story, driver error is almost always to blame! The couple of days in Sossusvlei were fantastic and exactly what we had hoped. We even had the rare experience of seeing a chunk of meteorite streak across the sky not more than a few hundred feet above our lodge while we had dinner. It was truly spectacular to watch the arch of light against the inky blackness and it was another reminder of how wild and unexpected this beautiful country can be.